"Elodea canadensis2 ies" by Frank Vincentz Licensed via Wikimedia Commons. Elodea is a genus of aquatic plant known to be a fine oxygenator for ponds and aquariums. Elodea in the Greek literally means marshy. Also known as waterweeds (American or Canadian) or water weed, Elodea is native to North America and is found in ponds and slow streams. The only place it is not found is in the extreme northern parts of the continent. It has also been introduced to many other parts of the world. Some species of Elodea, introduced in England in 1841, clogged up canals and waterways. It is considered a problem plant in many areas of the world. However, in the United States, the Elodea is considered an excellent plant for use in ponds and aquariums. Elodea is a slender plant that grows from 4 inches to 3 feet depending on the depth of the water. The American waterweed (Elodea Canadensis) lives entirely underwater except for delicate white pistillate flowers that bloom at the surface and float on the surface of the water. Staminate flowers rise to the surface and release their pollen. The fruit of the Elodea ripens below the surface. Elodea produces heavy buds in the Fall that fall off and drop to the bottom and then begin to grow in the Spring; relying little on seed production. Geese, ducks, and swans like to eat Elodea plants so don't be surprised if growing it in your pond attracts some of these visitors. 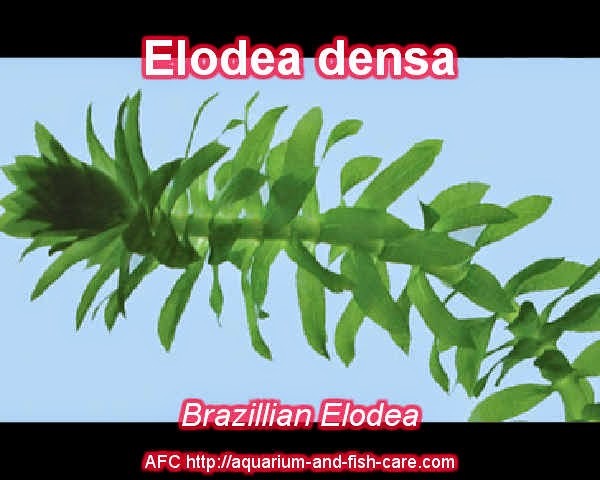 Elodea is also an excellent plant for the protection of fish fry. Gold fish will lay their eggs so that they attach to the stalks and the fry use the stalks for cover. Elodea can tolerate a wide range of temperatures, PH levels, and growth mediums. Before introducing new plants, it might be wise to keep them in quarantine or run the plants through a plant dip/bath to rid them of unwanted snails or algae. If you want a hardy, low-maintenance oxygenator plant for your pond, the Elodea is an excellent choice.